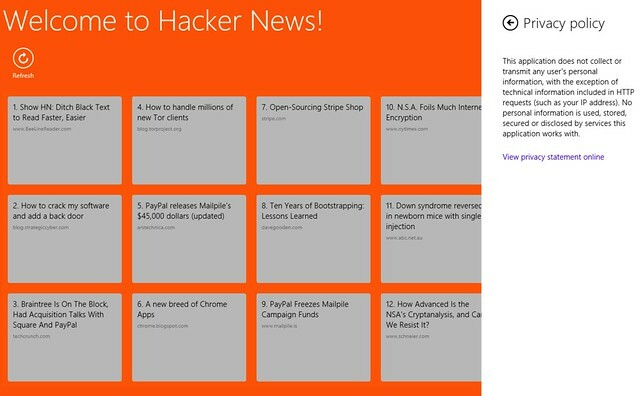 My application can be found in the Windows store. The functionality was going to be straight forward. 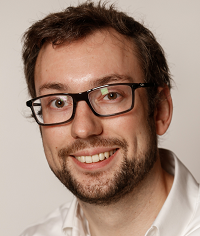 I wanted to provide an app which allowed users to browse and interact with the popular technology news aggregator - Hacker News. The app would be simple - at least for release 1. 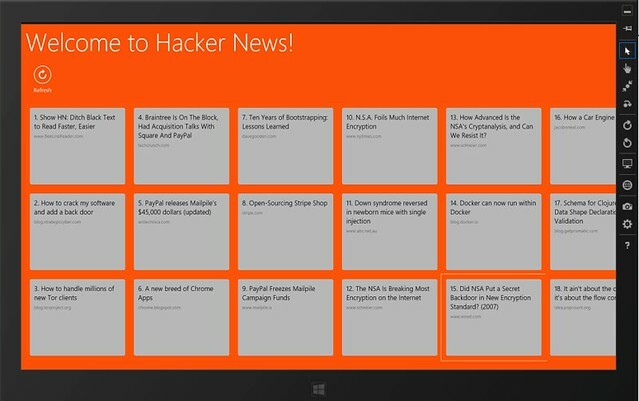 It would show users the top trending news stories on Hacker News. A user could touch a specific story to bring up the comment thread for that story. Bringing up the comment thread would also allow the user to browse to the original link. This would launch Internet Explorer and show the original article. The user could snap (or in Windows 8.1 it default snaps when IE is launched) and this would show the comment thread along side the article. So the application is very simple. In future releases more complicated functionality may be added. It was pretty simple to get started building the application. 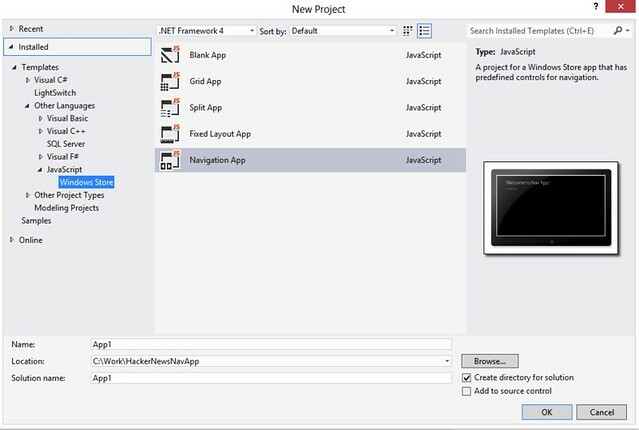 Using Visual Studio 2012 there are a variety of predefined project templates to choose from for building a Windows Store application. 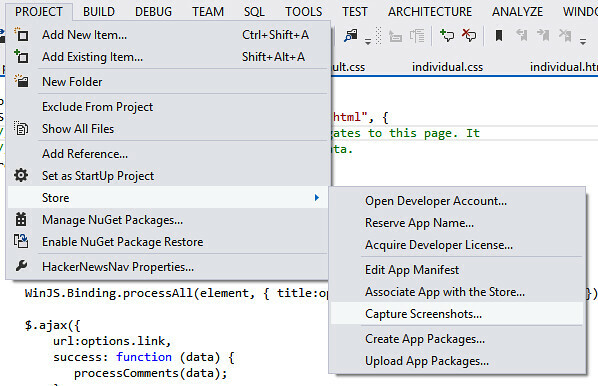 Choosing one of these templates will cause Visual Studio to prompt you to get (or renew if it has expired) a developer license from Microsoft in order to develop this type of application. These are free and need to be renewed every 30 days. 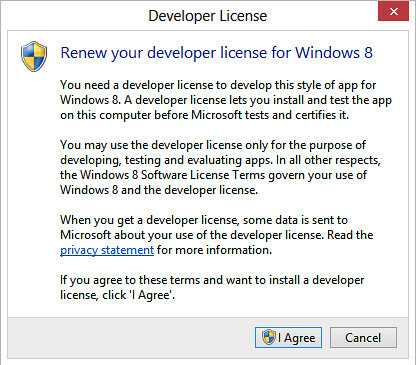 If you get a developer license through your developer account it has to be renewed every 90 days. In order to submit applications to the Windows Store for certification you have to get a developer account. 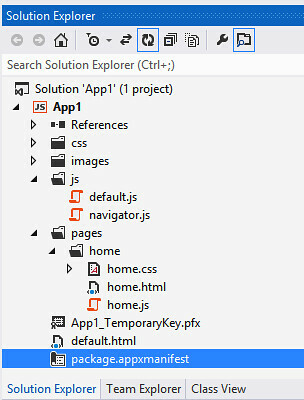 The initial project template I chose was a Navigation App Template. This gave me a default homepage out of the box and some predefined js files. Once I had the development side of my application done it was time to do some testing with it on a different device. This was relatively easy. 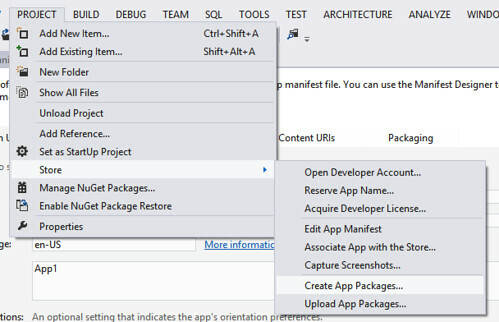 From the project menu you can choose to Create an App Package (Project -> Store -> Create App Package…). When this launches, you can choose to deploy it to the Windows Store or not. For testing on another development device you can choose to not to build a package for the store. This will build a package, along with a PowerShell script to install that package. You can take that package and put it on another device running Windows 8 device and run the PowerShell script. This will install the application allowing you to test it on that device. Now I was ready to upload my application the Windows Store. You will want to make sure your application’s package manifest is in order before doing this. This is a set of properties about your application, including various logos and screenshots etc. One key thing to note is that, by default, Visual Studio automatically selects the Internet(Client) capability. If your application does not need this option then make sure to uncheck that before deploying. 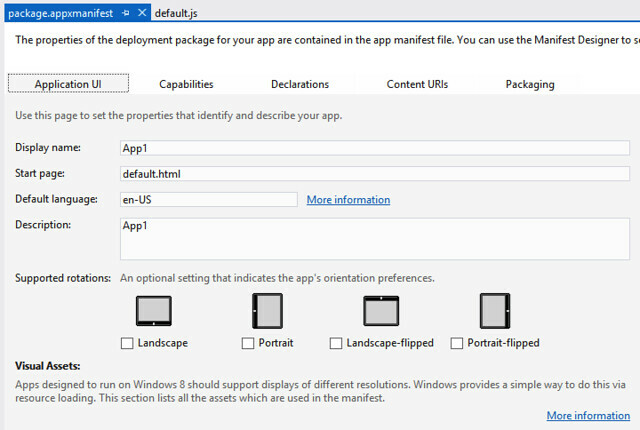 With that setup you can now create a package for the Windows Store. You go to Project->Store->Create an App Package… and this time choose to build a package for uploading to the Windows Store. This process will run through various tests and if you get any failures make sure to correct them. I hit a couple of failures that were due to not setting the build mode to Release. Switching to that mode solved the App Package test failures. At this point, once the tests have passed you are now ready to upload the package to the Windows Store. Logging into the Windows App Development site takes you to your dashboard. From here you can choose to Submit an App. This brings up a checklist that will walk you through the process. which launches a nifty simulator and allows you to capture screen shots of your application. Finally you upload you application package - this will be the .appxupload file created in your application package folder which will automatically upload the correct application package. At this point you are set to submit the application to the store for certification. This process can take some time (several days depending on your application complexity) but you get a nice helpful checklist informing you of the different stages and which ones are in progress etc. For my application, I failed certification a couple of times and finally passed on the third time. The first time I failed because I had said my application was suitable for ages 3 and up but because it allowed users to access external sites this was not appropriate. Selecting 12 years and up got me past this hurdle. This results in a nice privacy page flyout that satisfies the Windows Store Requirement. To overcome this issue, I reworked the application so that the main experience took place in the application and that visiting the original link was not as prominent a feature as originally planned. Once the application was certified it was published to the application store. After a day or so I could search and find the application and could download it and install it. Overall I found the experience very easy and intuitive.